How Tall Are Class A and Class C Motorhomes? 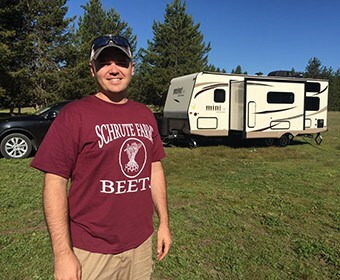 In checking into the options of whether to store my RV elsewhere or at home, I found that storing at home, even with a few expenses was the best option. I found that measuring from the ground to the top of the unit, measuring the air conditioner, and adding the two gave me the correct height of my Class A motorhome. Class C RVs average 10 feet tall and Class A RVs average about 13 1/2 feet tall. But the actual height of your motorhome will probably vary from that. Some salesmen will tell you the height of the motorhomes, but may actually be an inch or two off. So measure your motorhome accurately by measuring from the ground up to the top of the unit. Measure your air conditioning unit, and add the two numbers together to find out the true height. Some garages are built with a storage area for Campers and RVs. However, they are usually 12 feet in height. It is not likely that you will be able to fit your motorhome in the spot. Some Class C motorhomes may barely fit. However, a class A motorhome, usually measuring out at 13’6” will not fit. Most motorhome garage doors are 16’ tall. If your class C needs only a couple inches more room to be able to drive into your garage, you can have your garage door opener installed on the side which will give you the extra room you need to be able to store your class C motorhome at home instead of paying to have it stored elsewhere. It’s a slim-profile garage door opener with the motor on the side instead of on the ceiling. Sometimes it’s called a screw-type garage door. A second option is to have an RV mechanic move the air conditioner to the side of the motorhome, so it is less tall. This expense is minimal compared to storing your motorhome elsewhere during winters down through the years. What Happens If My RV Isn’t Stored for the Winter? If I don’t store my RV for the winter, the RV is likely to end the winter season with seal damage, leaks, graphics will fade and crack, possibly, and streaks may appear on the sides due to dirty run-off from the top of the motorhome. This is truly a case where an ounce of prevention is worth a pound of cure. The value of my RV may depreciate a lot if it’s not cared for. What If I Store My RV on the Driveway? Aside from not leaving much room for anything else, some areas may have HOA restrictions against it as well. We also usually have a heavy snow or two each winter, which could cause problems with the roof of my RV. Definitely, do not store your RV on a grassy area through the winter. It would be difficult to keep it level as it may settle over the winter months. Insects or mice try to enter the RV to escape the winter through any places you have not covered well on the bottom. Will Covers Be Adequate Protection If the RV Is Left Outdoors? While covers may offer some protection, they can also cause damage if not used just right. Loose covers will blow against the exterior and possibly damage graphics. Antennas may rupture the cover, causing rain and snow to directly come in contact with the motorhome. Lining the covers up can be hard. The door opening in the cover might not come even with the motorhome entry door. Covers can also trap dampness and moisture which can lead to mold and, in extreme cases, even rust. Then there is the task of storing your covers while your motorhome is in use during the summer months. Before packing the covers, they must be completely dry inside and out, or mildew may possibly grow over the summer months, leaving you with the big job of cleaning and drying the covers before you can cover your RV with them. 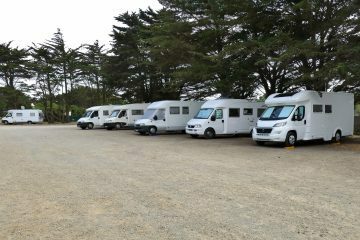 Why Is It Important to Store My Motorhome When Not in Use? A lot can happen to the structure of a motorhome if not stored properly. It’s more convenient to store your Class A and C RVs at home. If storing away from home, it’s best to remove the tires, else the RVs will need to be moved periodically to avoid flat spots on the tires. If the temperatures are going to reach freezing, you need to remove the batteries. Yet you will need to cart the batteries back and forth to your RV storage site and re-install them to move the vehicle to avoid those flat spots on your tires if you choose not to remove your tires for the season. This is not including the cost of gasoline to make those monthly trips. It’s plain to see it would be easier if I can store my RV at home. 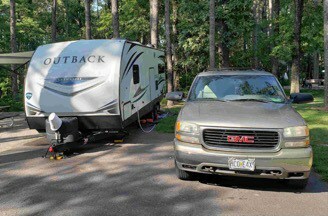 How Will Storing My RV Well Affect My Resale Value? If your RV is properly stored, the depreciation will be less, although there is always some depreciation the first year especially. 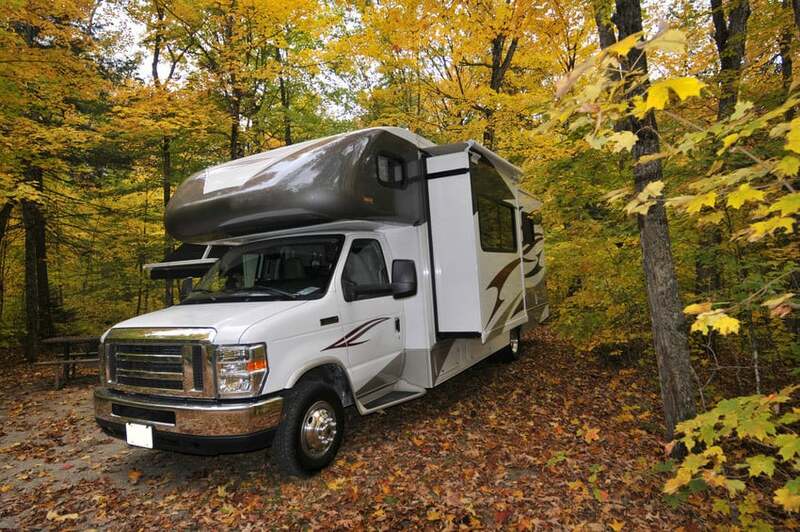 You can slow down the depreciation by maintaining your RV in good condition. If you’re looking to sell or trade in your RV in the future, remember that people will be checking to see if the RV has been well-cared for. 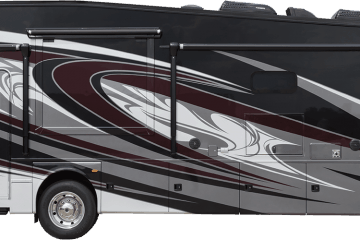 A motorhome with little streaking, bright graphics, no signs of leakage, and without odor will, without a doubt, fetch a better price than one with cracked graphics, water stains, and a smell of mildew or mold. That having been said, many people are shocked that they aren’t offered more on a trade-in in good condition. Often the dealer offers less than what the books say its worth. This is why negotiation skills are important. 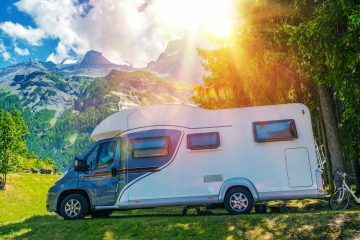 How Much Does It Cost to Store My Class A or C Motorhome? The cost of storing your RV adds up over the years compared to the cost of having a slim-profile garage door opener with the motor on the side installed to allow for those few necessary inches to get your RV into your garage. 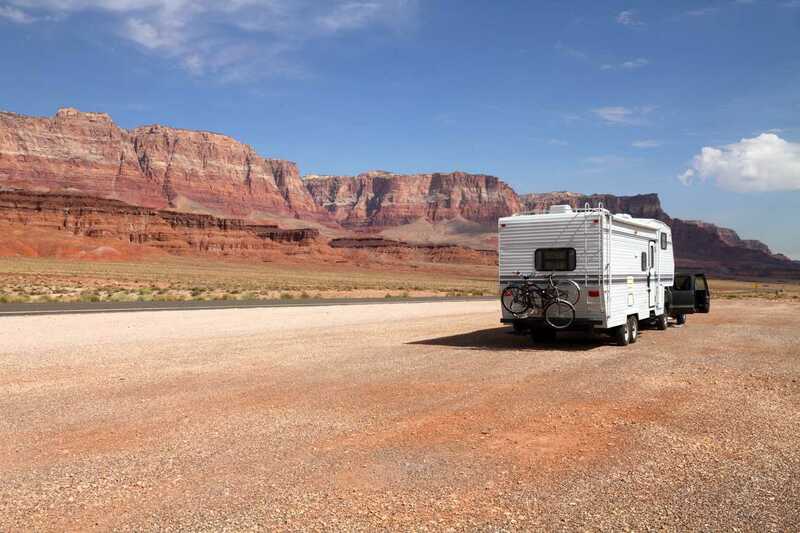 The cost for storing your RV away from home will vary depending on size and place of storage. Outdoor storage can cost me anywhere from $30 to $100 dollars a month. 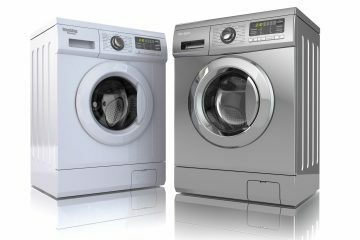 Indoor storage without heat can set me back $50 to $125 a month or more. Heated storage, (in wintry areas), can cost me anywhere from $100 to $450 a month. At these rates, storing my RV elsewhere for just five years can run to more than two thousand dollars. Seeing the prices per month for storing my RV elsewhere made me decide that the new garage door opener would be worth it to save money. How Much Are Slim-Profile Garage Door Openers? Slim-profile garage door openers, or screw-type garage doors as they are sometimes called, can range in price from $303 to $615 depending on the brand. They usually mount on the side which would give me the few inches I need to store my RV at home. I could see that the one-time expense would be less than if I paid for storage elsewhere over the years, not to mention the inconvenience of carting my batteries back and forth to move my RV to prevent the flat spots on the tires. It would be much easier to do this at home. How Much Are the Installation Costs of a Slim-Profile Garage Door Opener? I checked into a few places and found that installation might take a couple hours with the cost per hour ranging from $65 to $85 an hour. Even at a total of $170 for labor, I would still save money storing my RV at home. Just to be sure of the costs, check out some companies on your own for your estimates. Having discussed the basic costs of storing my RV at home, I realized that a price can’t be put on convenience. When it’s twelve degrees outside, there is nothing better than to step into my own garage to tend to my RV instead of going out into the cold and drive through ice and snow to take care of my RV. In fact, such weather conditions just might make me want to put it off if my RV is stored elsewhere. What If The Motorhome Can’t be Stored at Home? There may be circumstances where you simply can’t store your RV at home. If that’s the case, then shop around for the best storage and security you can find for your investment. When Should I Begin Thinking About Storage For My Motorhome? The best time to think about storage is before you buy your RV, so you can protect your investment and prevent unnecessary expenses. 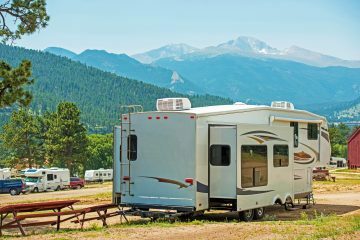 It’s easy to be unsure how to store your RV as you can drive down the road and see many RVs sitting out with not even a cover in ice and snow during the winter months. Hopefully, this info will keep your storage costs down and your RV well-protected. If so, you will avoid additional expenses and repairs in the spring when you begin to plan your next camping trip. 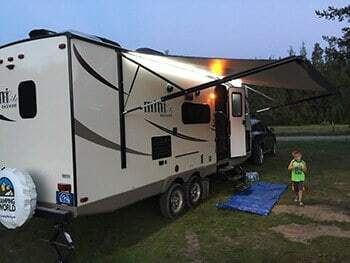 Should I Tow My Camper Home With a Broken Awning?